Pasadena—the home of the cheeseburger—will now be getting a brand new tenant that might feel a little familiar. 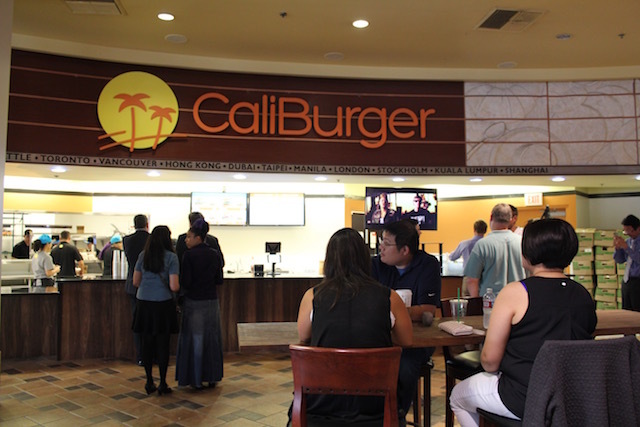 Having coined a reputation for themselves early on as an In-N-Out knockoff, CaliBurger has since tried to reinvent themselves with an emphasis on tech and food. CaliBurger has been around internationally for five years. They opened their first store in Shanghai and have since expanded to Bahrain, Dubai, Kuwait, Malaysia, Hong Kong and Tokyo, to name a few. CaliBurger gave LAist a tour of the new place in Old Town Pasadena, which is not yet finished. The official grand opening date will be June 19. Soft opening will start June 9 by reservations only through their CaliBurger app. During the first look, CaliBurger founder and chairman John Miller made no mention of In-N-Out, but instead chose to focus the attention on how the technology they are developing is going to change the food industry. Miller was clear that machine-made cheeseburgers were in the near future for CaliBurger. Once open, CaliBurger in Pasadena will tout mobile ordering and reservations, self-ordering iPad kiosks, wireless charging stations, and interactive gaming. Patrons can play a hangman-style game or Minecraft. The most popular items on the menu are the Cali Double, chipotle BBQ chicken sandwich, and the Cali Style fries. The Cali Double included two beef patties, melted American cheese, tomatoes, and iceberg lettuce. There&apos;s also the option for the burger to be made "Cali Style," which adds melted cheese and grilled onions to burgers. Although the patties were very juicy, even juicer than In-N-Out&apos;s, the burger itself was on the salty side. The bun also left a bit to be desired. The vegetables, however were fresh and crispy. The chipotle BBQ chicken sandwich was my favorite of what I tried. 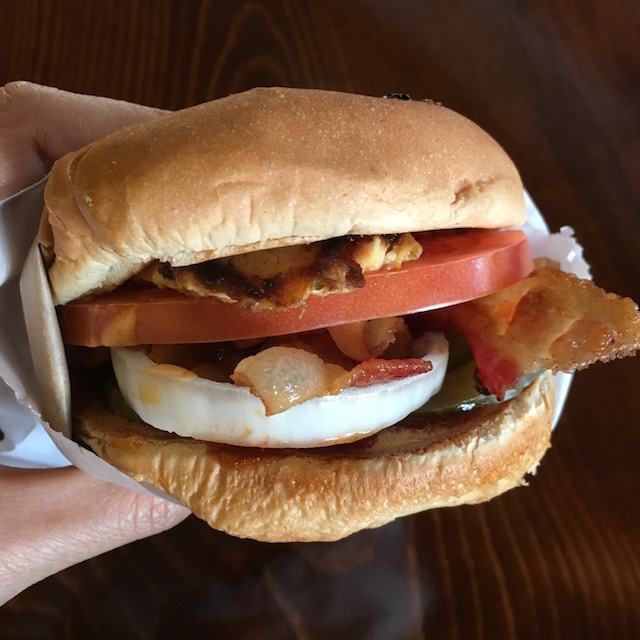 The lemon and herb marinated chicken breast was topped with tomatoes, bacon, raw onion, pickles, and CaliBurger&apos;s house-made chipotle BBQ sauce. 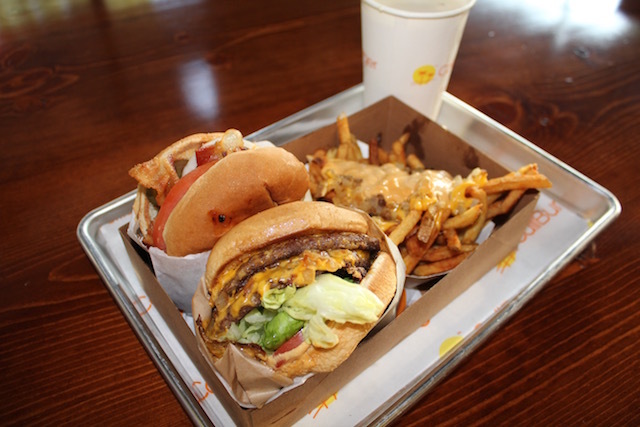 The Cali Style fries are smothered in melted American cheese, grilled sweet onions, and CaliBurger&apos;s signature sauce. The fries were crispier than In-N-Out&apos;s, but I enjoy the Animal Style fries more. CaliBurger will also serve alcohol. The handmade milkshakes have the option to include a shot of bourbon to the chocolate, vanilla, or strawberry milkshakes. No need to sneak that flask into In-N-Out anymore! They are currently working on getting wine into the mix as well. The vanilla shake spiked with a shot of bourbon was delicious. The shake was better than In-N-Out&apos;s—definitely worth trying. 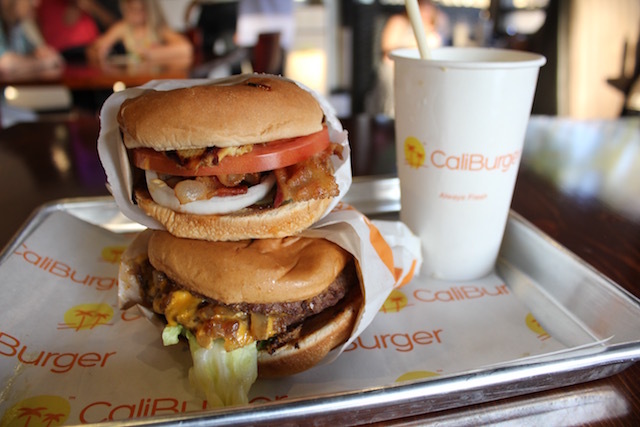 CaliBurger is located at 245 East Green Street in Pasadena.